Sure I could manage a whole one .. 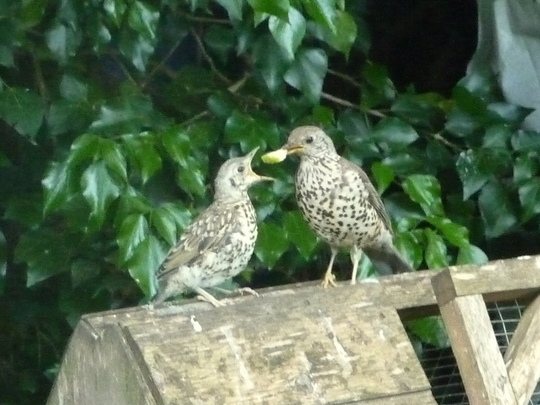 Fledgling Mistle Thrush by Jane. That's a great photo. Well captured. What a brilliant shot Jane, well captured. Thanks for all your kind comments.There are two babies but not managed to get photo of both being fed ! Oh my goodness, what a mouth! Lovely photo, BB. Well caught Jane, thanks for showing this. They are so gorgeous. Are they eating chopped apple.? It is Jacque...feel priviliged and proud that they trust us.If you have time to see latest blog....even coming in porch for food ! The blog is Knock Knock whose there !..Blackbird coming in porch for mealworms....what a life ! Well caught at the right time beautiful Photo . Thanks everyone.....still doing well despite a foiled attack by a sparrowhawk ! The parent actually chased it off...never seen that before ! Oh Sid...the racket ! The Adult thrush was sounding like one of those old fashioned football rattles,and was so determined to lead the hawk away from her baby ! Know all have to feed but have to be rooting for parents when protecting their young and risking life and limb ! Thank you Pamazon.We live next door to a rookery but they dont bother us.Have a few jackdaws and the birds in general chase them away.Welcome to Goy...off to look at your photos shortly. Janey...its a chunk of apple ! The thrushes and blackbirds are going mad for apples at the moment ! What a wonderful photo. I haven't seen a mistle thrush in years. The last time was in winter in Newport, South Wales, snow on the ground, and it's territory was being invaded by field fares. I was in an upstairs flat with a good view. The thrush was perched at the top of a holly tree which was covered in masses of berries. Just half a dozen field fares came at first and the thrush noisily chased them off. I was so pleased for it but soon the field fares were back, this time about thirty. Once more they were chased off but came back with reinforcements - I'm sure there must then have been about one hundred birds. The thrush gave up and flew off and the field fares proceeded to strip the tree completely of the berries. Those that had fallen to the ground were cleared up too and then the show was over - away they flew. A few moments later a lady emerged from her back door and emptied rubbish into her dustbin, totally oblivious to the spectacle that had taken place in her back garden. I felt priviledged to have seen it. Thankyou Notepad.Must have been wonderful to see that flock of fieldfares ! Great shot! What kind of camera was it taken with? Thanks N2...taken with a Panasonic Lumix 10 X optical zoom ! LOL Flower..open their mouths and shovel it in !! Thanks Bonkers. A lovely pic. The way you welcome the wildlife to your garden is an inspiration to me and I hope to many others. Thanks Toto and yes even you Sanbaz - nice of you to help Clarice - anyway I digress ..you re far too modest Toto your photos have been great and despite being stung so many times by them ,allowed me to see wasps in a different light .. quite an achievement. Your going to regret your last comment Bonkers as it reminded me that I have dozens of pics of my queen and her nest right up to the time whe left. I'm thinking of putting together the most tedious and boring blog you've ever seen. I hope the other GOY members remember that it was you who reminded me so you can take at least half the blame. Tedious and boring ? Never ! Just look at the comments you always get for your smashing pics Toto. On a lighter note...only 50% of the blame ? I know we are in a recession,but Im used to getting it all !!! Believe me Bonkers. It can be arranged. I'll let Milky know and she can spread the word. By the way, I'm a bit worried about Milky, she seems to have gone very quiet lately. I've had no abuse or threats at all since she came back from her holiday. Do you think she has been on the road to Damascas? Do you think he kidnapped her? No stupid thought. He would have given her straight back to SP. Lovely to see the thrushes. Don't see many of them around these days. Perhaps if more people stopped using slug pellets nature would return things to normal. Agree Lindak...no pellets in this garden,but find lots of empty shells ! Just had a thought, crush them down to put around plants to stop the slugs. I've only just seen this photo Jane .. Fabulous, well done.